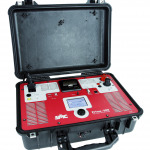 The PME-20-PH is an instrument designed mainly as a phase angle meter, although other parameters, such as Frequency and Power Factor can be measured. The instrument has an analogic scale that enables it to be used as a synchroscope. The instrument has two inputs, which are galvanically isolated: a voltage input up to 500 V RMS and current input up to 25 A RMS, that can be connected directly into the input taps. The phase angle measurement has a resolution 0.1º, regardless of the input values. 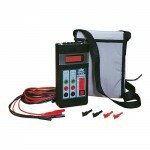 Inputs to 750V and 1000 A can be made using optional accessories. The instrument is supplied with 4 rechargeable AA size batteries, which provides a 6-hour autonomy. The display is a Graphic LCD, with a back light that can be adjusted to suit the ambient conditions. 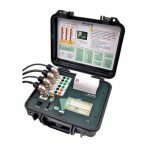 The measurement results are presented simultaneously with the necessary complimentary data, and in the case of the Power Factor measurement, the instrument indicates the phase angle quadrant. Voltage input: 0.2 to 500 V RMS direct. Current input: 0.1 to 25 A RMS direct. Power Factor: 0 to +/-1, indicates phase angle quadrant. 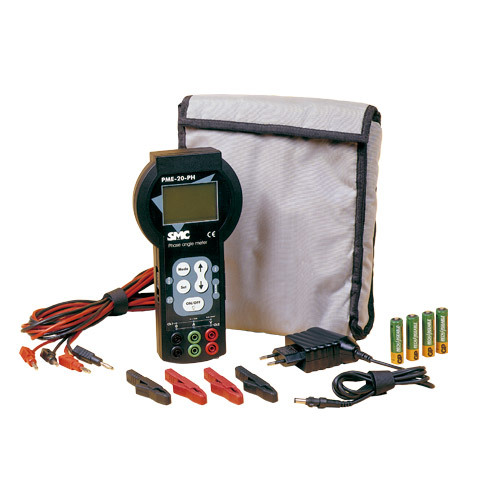 Measures the phase angle between two Voltages, two Currents, or Voltage-Current. In general, for Maintenance in Transmission and Distribution Systems, all well as industrial or commercial centers.